Coolsculpting® is a procedure where fat is frozen away. Fat cells freeze at higher temperatures than surrounding tissues and CoolSculpting® technology takes advantage of this, using precisely controlled cooling to target fat cells underneath the skin. The treated fat cells are crystallised (frozen) and die and, over time, your body naturally processes and eliminates these cells – leaving a more sculpted you. 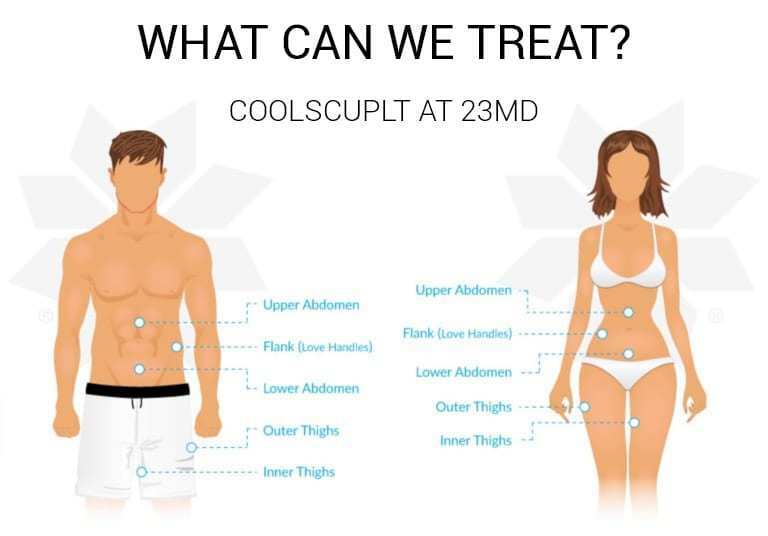 WHY SHOULD YOU HAVE COOLSCULPT® AT 23MD? Our practitioners have earned the much-coveted training degree provided by CoolSculpting University. This involves a comprehensive 2-day training program by ZELTIQ®. 23MD is committed to offering clients the highest degree of professional care and we ensure you receive the best possible Coolsculpting® experience. CoolSculpting® is a non-surgical fat reduction treatment that involves the use of a specialist ‘Cryolipolysis’ device. Once the desired treatment area has been located, the device is carefully positioned, and controlled cooling is applied. This process gradually crystallises (or freezes) the fat cells and causes them to die. In the weeks and months following your procedure, your body will naturally process and eliminate these dead cells – and one they’re gone, they’re gone for good! The CoolSculpting fat freezing procedure is completely non-invasive and clients can typically return to work and normal activities immediately following the session. CoolSculpting® is a popular non-surgical option for clients who would like to get rid of stubborn areas of fat. These areas could include a persistent stomach ‘pooch’ or bulges on the hips, which refuse to budge despite dieting and regular exercise. It is important to note, unlike a number of surgical weight loss solutions (e.g. gastric bypass, liposuction), CoolSculpting® is not intended for people who are obese. It is also unsuitable for people with cryoglobulinemia or paroxysmal cold hemoglobinuria and any existing health conditions should be discussed in your first consultation. The cost of this specialist fat reduction technique will depend on a number of factors, including the area to be treated, the number of sessions required and your goals. Here at 23MD, our team of experts will discuss your individual needs and create a treatment plan, that is tailored to you and your personal budget. The exact number of Coolsculpt® sessions that you require will depend on the target body area, your individual requirements and what you personally want to achieve. During the first consultation, a customised treatment plan will be created, which outlines the intended number of sessions. However, if necessary, extra sessions can then be added to the plan at a later date. IS THE COOLSCULPT® PROCEDURE SAFE? CoolSculpting® is one of the safest, most effective fat reduction procedures currently on the market. It is fully approved for use on the abdomen, thighs and flanks and has been backed by countless clinical and scientific studies worldwide. During the procedure itself, you may feel a little discomfort – such as a pulling, pinching or numb sensation on the targeted skin. However, this feeling soon fades, and most people find it possible to relax (or even take a nap) during the treatment. As a non-surgical and non-invasive procedure, the side effects associated with CoolSculpting® are relatively mild. You may experience redness, swelling, bruising, skin sensitivity and a slight aching sensation at the treatment site; however, these symptoms are temporary and will quickly fade away. You should start to see an improvement just 3 weeks following your first CoolSculpting® session and the most dramatic results are typically seen at 2 months. However, bear in mind, it takes time for your body to naturally eliminate the dead fat cells. The effects are very gradual and, therefore, can continue for up to 6 months. DO I NEED TO FOLLOW A DIET AND EXERCISE PROGRAM? CoolSculpting® is a stand-alone fat reduction treatment and you will not be expected to adopt any special diets or exercise programs – either before or after your sessions. However, following CoolSculpting® treatment, most people feel motivated to take care of their body. Eating healthily and doing regular exercise is always recommended and it can help to maintain the effects of the procedure.